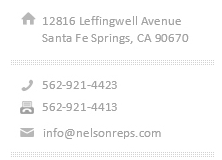 Nelson & Associates is one of the largest manufacturers' representatives in the Southwest. We have worked for over 40 years to create a company culture that is built on teamwork, open and honest communication, dignity and mutual respect. Our goal is to provide outstanding customer service, quality and value through our dedication to continuous improvement of people, processes and products. Our line card of permier manufacturers provides the marketplace innovative solutions and services. ©2019 Nelson & Associates. All rights reserved.